TO BE THE MAN! YOU GOTTA BEAT THE MAN! WOOOOO!!! I’ve been writing reviews for this site for over four years and I have been dying to write more wrestling references. Thankfully Robert Venditti actually puts not only a wrestling reference into this issue, but it’s a reference to the greatest stable in all of pro wrestling history. Okay enough about wrestling, let’s move onto the comics. Warning they’re will be spoilers going forward, so be sure to read your comics before reading this review. You have been warned. You’re gonna hate me for writing this again, but the best part of this arc in particular has been the dialog between the four corpsmen. None of their scenes are ever over written, each page featuring the four corpsmen is short and precise while adding a dash of humor and while this formula is repeated it never gets old. I know that some might say only long term readers will actually resonate with these scenes, and I would disagree. You don’t need to have decades of history with these characters to understand how their dynamic works, it’s all on full display in this issue and this arc as well. One thing I haven’t really commented on is the Controllers themselves. I’ve always been a fan of reinventing silver age villains for the modern age, it’s a balancing act of staying true to their essence but also updating them to be more of a threat. As this arc has progressed I would call the reinvention of The Controllers a successful one. Through their costumes they retain their silliness but their deeds give them credibility as a threat to the Green Lantern Corps and The Guardians of The Universe. While I understand the overall goal of The Controllers I’m just slightly confused on how they’re actually achieving their goal. Perhaps I’m overthinking it but it seems to me that they are sucking out the life force of the Guardians but I’m confused if they’re actually dead or just mostly dead. Can I just keep singing the praises of Jack Herbert? Is that all right with you? I’ll just continue to pour my eyes over each page and panel for each miniscule detail. It’s obvious that Herbert can draw big iconic superheros with barrel chest and amazing action scenes that give dynamic perspectives. The only minor complaint that I had with Herbert’s art was his faces for certain character were more exaggerated than they needed to be. Thankfully that’s only a few instances within this issue, besides that small nitpick Herbert has been batting a 1000 since the start of this arc. 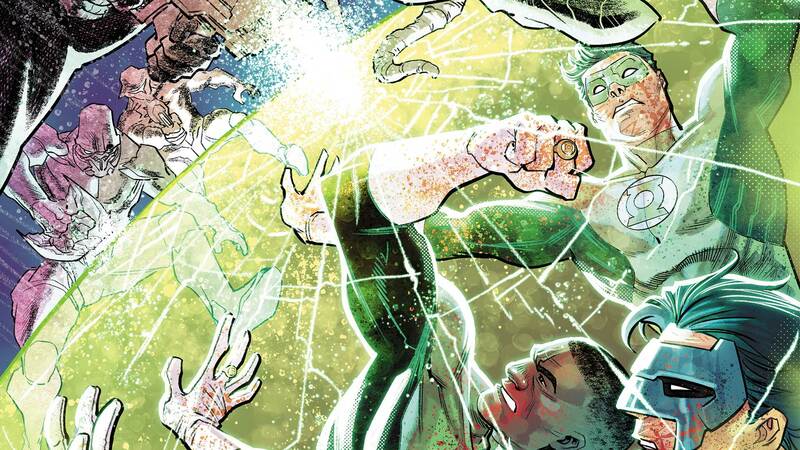 Even though the story is moving relatively slow in terms of plot reveal, the intense action and witty dialog between the four corpsmen this makes for one fun issue. WOOOOOOOOOOOOOOOOOOOOOOOOOOOOO!